Sheila Maguire is a Senior Fellow at the Aspen Institute Economic Opportunities Program focusing on leadership and talent development in the workforce field. Sheila designed and served as lead faculty for the Aspen Institute’s National Sector Skills Academy and has developed and lead local leadership academies in Seattle, Baltimore, and New York City . 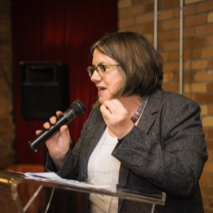 Sheila brings experience as a practitioner, capacity-builder, and researcher to her work. She founded Training, Inc. at Essex County College in Newark, New Jersey. where she placed welfare recipients, people returning from prison, and young adults into jobs and developed industry-specific certificates that provided skills for immediate employment and the start of a college career. As a senior staff person at Public Private Ventures, Sheila headed the evaluation team for a Random Control Trial (RCT) of three nonprofit sector-based training programs, created curriculum for frontline employer-facing job development staff, and supported social purpose staffing agencies in the Gulf Coast. She has authored or coauthored various publications including Optimizing Talent: The Promise and Perils of Adapting Sector Strategies for Young Adults, Aspen Institute and JobsFirstNYC, 2016. Sheila holds a B.A. in adult learning from the Gallatin Division at New York University (honors scholar) and an M.S. in organizational development (with distinction) from American University. She was a founding board member of the National Skills Coalition, an advisor to the New York City Labor Market Information Service, and an ambassador for her hometown of Coventry in the UK. Before moving to the United States, Sheila worked in community development Speke, Liverpool, the Isle of Dogs in London’s East End, the Abruzzi region of Italy, and bustee communities in Calcutta, India. Can well-implemented, sector-focused training programs make a difference to the earnings of low-income disadvantaged workers and job seekers?